Chances are that if your dog has fur he has had fleas at some point. Actually, even if your dog doesn’t have fur they can still get fleas; they just hide better in fur. At some point you’re going to need to do something about them if you haven’t already. So let’s get down to it. There are plenty of medicinal options out for there you to choose from – Frontline, Advantage, etc. – and there are plenty of versions – pills, topical, injections. Is any one going to be better than the other? Absolutely, but with a few clauses. Quick tip: giving your dog a bath regularly will help in the fight against flea prevention. Be sure to use the right kind of shampoo and begin at your dog’s head and neck, working your way down. First off, every dog is going to react differently to various medications just as a human would. For example, one dog may do very well with a pill form of flea prevention and do very badly with the exact same brands’ topical version. It is also important to take into consideration your dogs’ weight as getting the best application is based on this. There are also medications that are made specifically for certain breeds and weights. This is why it’s important to speak with your veterinarian about the best choice for your dog. Your veterinarian will be able to tell you what has the best track record for what breed, age and environment your dog lives in. So remember that if your first choice didn’t work there are several explanations. One possible reason is your dog has sensitive skin. There are some breeds that react badly to topical ointments and other dogs that simply may just be allergic to that type of flea treatment. Remember that after applying your chosen medication, fleas will continue to hatch and appear on your dog for several days. In fact, it can take up to a month for the medication to take full effect. The strength of each medicine will vary, but know that your veterinarian can prescribe stronger flea medication than you could buy in a store on your own. 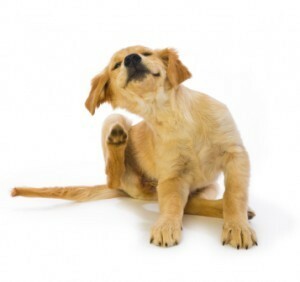 Quick tip: if your dog has fleas, use a flea comb regularly to remove them. Keep a bowl of soapy water nearby and dip the comb in after each pass. After giving your dog the medication there are also monthly applications available. This is a great preventive measure to use on an ongoing basis, especially if you dog is primarily outdoors. It’s also possible to treat your house or yard for fleas by using water-proof chemicals. This may speed up the process of getting rid of them. Multi-preventive medications are injections or monthly pills for your dog that guard against fleas, ticks, or other parasites. Injections are not only becoming more popular because of their effectiveness at killing fleas, but also their longevity – a typical flea prevention injection will last up to 6 months! With knowledge on new products, success rates, and breed specific options, your vet will be able to recommend the best option for you and your dog.